Hello Pep (Josep Claros), let us congratulate you first on Liga Americas title with Pioneros de Quintana Roo-Cancun and of course on Coach of the Year award. 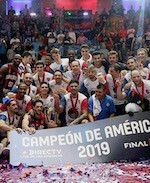 Let us know please is the Liga Americas title the most important trophy in your coaching career so far? Is something hard to say because I have a lot of feelings for all the other titles as well. Obviously in America is a big thing, and I know this one will be in the Mexican history forever, but I really think every championship was special. Is difficult to reach the final and even more to win so Im proud of every championship I got because is always a lot of hours, a lot of personal connections fighting for the same goal and a lot of experiences that you just know when you win and lose finals. Which game was the most difficult for you and your team at the Final Four Tournament? All of them. I will explain why: the first one because we were playing against the home team and even we had a lot of confidence there are some things you cant control playing away. We knew we could beat them if we had the mentality to smash and send a message, let everybody knows that we were good enough to win the championship. In some point we were 27 up, we finally won by 18. The second one was difficult because the Brazilian team has winning experience and players like Giovannoni and Alex (ex- Maccabi) and 3 National Team players. The last one, was obviously tough because Obras Sanitarias is the best Argentinean team, with the National Team head coach and they just need to win by 1 to be champions. We won by 9 and we were ahead all game using 12 players in the first half. Can you compare the level of Liga Americas with some of the European leagues? Liga Americas is a competition that every game is all or nothing. You have to win 3 finals four before get the championship. All the teams you compete against are the best ones of their countries, so they know what it takes to get there and they have the best talent of their leagues. Every country has their own characteristics in terms of style of play. Is not the same to play against a Brazilian team than to the Argentineans and even more different if you play against the Puerto Rican team. You have to be clearly the best and do well some aspects of the game like dominate the rhythm, develop the toughness during the competition and have a good team mentality. You reached 13 Finals so far with different teams in different countries. Which one you will never forget, except of the Liga American Final 4? I have good memory so I will remember all of them...I also remember all the losses I had so eventually they push me to keep fighting. I will not forget a game when with American University (NCAA Div. II school) we upset No.1 in the country Arkansas who was undefeated at that time. It was 16 years ago in a Christmas day. It wasnt a title game but it was just special and we made a big presentation to college basketball. After that we won the conference 2 years in a row with just 3 loses in 2 years and beating other schools like top 10 Alabama or Texas C. and Hofstra. You started the season with the Halifax Rainmen. It was the inaugural year of the NBL Canada, so can you please tell us something more about the league? The NBL is an athletic league where you can have 10 Americans per team. Most of the players have stints in Europe , D- League and some even NBA. Is very interesting to see because you have all of the teams with real possibilities to improve the roster (22 transactions during the season) and to win every game because you are constantly thinking about winning the game but also to recruit the best talent available at the same time. Most of my players had played in Europe so they could adapt to practices and some of rules that I adopted. What are your plans for the next season? You are still Head Coach of the Mexican National Team. I will decide very soon. The Pioneros of Cancun organization will run the team so it looks that Mexico could have a strong team if they add 5 or 6 players to the Mexican team we won the Liga Americas. After the silver medal we got in 2010 is a good opportunity to keep winning internationally. If they can have the best players Mexico can be very close to Argentina and Brazil , so eventually we could have good results. In the other hand there is an option in Europe that could be an excellent project for an emerging country that I m sure will be top in the very next future, because they have talent, physical strength, mentality and is run for good basketball minds. My goal is keep winning so I feel very fortunate if Im part of them. Thank you Pep and we wish you all the best in the future!